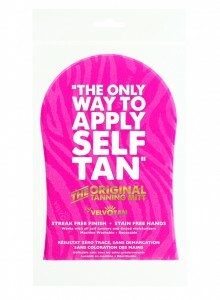 Get your mitts on the latest development in self-tanning, the Velvotan Mitt in three brand new colours. Velvotan is the original creator of the tanning mitt concept – a silky smooth application device you slip over your hand for smooth, streak-free self-tanning. Once upon a time, suspiciously orange palms would have given the game away for fake-tanners everywhere. Now, thanks to the tanning mitt, it’s almost impossible to tell the difference between a salon and a DIY job. The SS12 catwalks showcased deep, tanned skin tones with plenty of bronzer and burnt sienna blusher. We recommend you get the look by heading down to the salon for an all-over spray tan in a deep shade, before topping up regularly with your Velvotan mitt to ensure that sun-kissed bronze lasts the whole season. The Velvotan mitt claims to deliver a flawless finish with its patented lotion-proof barrier, which can be used again and again after a quick cycle in the washing machine. It’s often the simplest products that work the best, so for smooth, radiant, even-toned skin, head down to Tesco and pharmacies nationwide to bag your mitt for £2.99.